Your local shop gets you ready for the ride. At TrailHouse, we're part of the ride. As such, we're on full standby to get you out there and back with as wide a smile as your zygomaticus can muster. If you need it, we stock it. If you want to try it, we'll loan it to you. Look for us to stock a fleet of demo rigs from brands like Specialized, Santa Cruz, Kona, and Ibis. We'll have a substantial fleet, but reservations should be made if at all possible. People like riding bikes around here. Anything a shop can do, we can do, and probably better. Plus, with us, you can have a beer and a sandwich, maybe even while you wait. 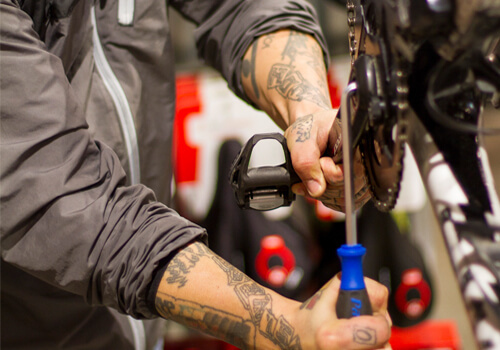 Our staff are fully-trained mechanics with years of shop experience under their beer-backed belts. From salvaging a ride due to last-minute J.R.A. issues to full fork overhauls, wheel rebuilds, and brake bleeds, we can do it all. Look, our first priority is somewhere for us all to take a load off, quench a parched throat, and talk some smack. But we've got just about anything you'd need to start or finish a ride tucked around throughout the place. Clothing by Kitsbow, tires from WTB and Specialized, and a mountain of don't-leave-TrailHouse-without-it accessories are well within reach for us. Feel free to forget. We've got you covered.